Posting positive demand for the 23rd consecutive quarter in the fourth quarter of 2015, absorption in the national industrial market totaled nearly 220 million square feet during the year, with the pace of absorption increasing across most major markets. Several trends and factors are supporting strong demand in the industrial sector. Most notably, e-commerce sale activity continues to increase at an impressive rate and companies are responding to consumer preferences by shortening the supply chain to deliver goods more quickly. Additionally, a number of coastal markets are also benefitting from the anticipated opening of the Panama Canal expansion. Given the changing landscape, demand in the industrial sector is projected to be healthy through at least the near and into the long term, and to a significant degree, a sizeable amount of absorption in the industrial sector will come at the expense of the retail sector. Absorption in the industrial sector during the year was led by the logistics segments, though positive demand was also noted in the light industrial segments. Demand remains robust throughout all regions. The strongest absorption figures continue to be noted for logistics space in primary industrial markets, including the Atlanta, Chicago, Dallas-Ft. Worth, and Inland Empire markets. Absorption in the Midwest region is led by the Chicago market, followed by the Indianapolis, Detroit, and Twin Cities markets. Led by demand for warehouse and distribution space, absorption in the Twin Cities industrial market totaled approximately 3.55 million square feet in 2015. The light industrial segment in the local market also was consistently healthy during the year. Led by growth in the logistics segment, new construction activity in the industrial sector increased at a rapid pace in 2015, with the amount of new distribution space added during the year particularly impressive. New construction deliveries involving logistics space, including both distribution and warehouse properties, increased by 2.5% over the year ended December 2015, while new construction in the light industrial segment increased by 0.2% during this period. Accounting for a significant portion of the sectors pipeline, speculative construction activity in the industrial sector has surpassed pre-recession levels, with sources indicating as much as 40.0% to 60.0% of new logistics properties under construction are being built as speculative projects. Among regions, new construction activity is strongest in the West and South regions, but construction levels were also strong in the Midwest and Northeast regions. Over 20 million square feet of new inventory was delivered in the Inland Empire market during the year, while new construction added over 15 million square feet of space in both the and Chicago and Dallas-Ft. Worth markets. Despite widespread industrial construction activity in the Inland Empire market, the market’s vacancy rate decreased into the low-3.0% range at the close of 2015, down 80 basis points compared to the fourth quarter of 2014. In the Northeast region, developers continue to remain active in the Lehigh Valley market, with Liberty Property Trust construction a 1.7 million-square-foot distribution building for Uline and Duke Realty scheduled to deliver a 1.1 million-square-foot speculative building in 2016. Development activity in the Midwest region was led by the Chicago market, but supported by widespread new construction in the Indianapolis, Kansas City, and Twin Cities markets. Although the pace of new construction activity in the Indianapolis market appears to be slowing, developers added nearly 6.5 million square feet of speculative space to the market over the last 18 months, adversely affecting occupancy levels in the face of healthy absorption figures. Developers added roughly 1.77 million square feet to the existing Twin Cities inventory in 2015. Development activity in the Twin Cities was strongest in the Southwest submarket, but developers are active throughout much of the area. In the face of robust new construction activity, vacancies in the national industrial sector decreased by 40 basis points in 2015, declining into the mid-7.0% range at the close of the year. Vacancy rates in over 20 major markets have fallen below 6.0%, and on the national level, vacancy rates have declined by approximately 3.5% in the last five years. Occupancy levels in the light industrial segment noted the most significant improvement in 2015, but vacancy rates continue to remain tighter in the logistics segment, in spite of new development activity. Occupancy levels further increased within most major markets. Vacancy rates remain tightest in the West region, but softer occupancy levels were noted within some markets in the region compared to the year prior. Occupancy levels in industrial markets throughout the Midwest largely remain strong, but a surge in speculative development is testing demand in several Midwestern markets. Vacancy rates in the Twin Cities market declined by a sizeable amount in 2015, and though excess capacity exists, noticeable improvements in occupancy levels were recorded in the Southwest submarket. Over 50.0% of major markets recorded year-over-year asking rent growth of greater than 3.0% in 2015, as rents increased at a robust pace in both the logistics and light industrial segments. Strong rent growth was noted across several Midwestern markets, and asking rents advanced across all submarkets in the Twin Cities industrial market, but the strongest growth was observed in the Southwest submarket. The industrial sector has emerged as a preferred asset type for institutional and foreign investors. Favorable investment returns and minimal capital expenditures compared to other asset types as well as the emergence of e-commerce have attracted investors to enter and expand their reach into the industrial market. Sales activity in the national industrial market increased by 44.0% year-over-year in 2015, with sales volume totaling nearly $72 billion for the year. Sales activity in the industrial market began the year at a robust pace, before reaching a lull in the second and third quarters of 2015, and then finished strong in the final three months of the year. Sales volume in the light industrial segment increased by approximately 30.0% year-over-year in 2015, but activity in the light industrial segment remains overshadowed by investment in logistics space. Industrial assets have become a favored property type among foreign and institutional buyers, resulting in stronger pricing and capitalization rate compression. The average sale price on a per square foot basis in the national industrial market increased by 9.5% year-over-year in 2015, while average capitalization rates in the sector decreased by 40 basis points during the year. Prices increased in both segments of the industrial market, with the average price per square foot in logistics approaching $70 per square foot and surpassing the $80 per square foot in the light industrial segment. Capitalization rates in both the logistics and light industrial segments compressed at a similar rate during the year, and private investors in the industrial sector remain aggressive in underwriting rents and vacancy. Some concern in the national industrial market, and in the broader commercial real estate market, is the greater amount of portfolio and entity-level transactions. Three massive sales accounted for over 20.0% of all industrial sales volume in 2015. Exeter Property Group sold a 57.9 million-square-foot industrial portfolio for $3.15 billion in December of 2015. Earlier in the year, Global Logistic Properties and Singapore’s sovereign wealth fund completed an $8.1 billion purchase of IndCor Properties industrial assets and operating company from Blackstone, while Prologis and Norges Bank Investment Management purchased a portfolio from KTR for $5.9 billion. The KTR portfolio contained 60 million square feet of operating space, 3.6 million square feet of space under construction, and a land bank with a build-out potential of 6.7 million square feet. A number of large single-property sales also occurred during the year, with a significant amount of activity noted in the Midwest region. Two of the largest single-property transactions at the national level in 2015 involved Duke Realty selling a mission-critical building leased by Amazon in Delaware for $91 million, equating to approximately $89.50 per square foot, and the sale of a newly-built Home Depot Fulfillment Center in Ohio for $97 million or $59.20 per square foot. Mirroring trends at the national and regional levels, industrial investment activity in the Twin Cities was strong in 2015. Several large portfolios in the Twin Cities market were sold during the year, but sales velocity drove sales volume in the local market and investment activity in the local market was consistent throughout the year, with healthy activity noted across all segments and submarkets. One of the largest transactions in the Twin Cities market during the year included the sale of the BAE building for $46.8 million to Gramercy Property Trust in July. Bolstered by a relatively modest rate of new construction activity, increasing personal income levels, and lower fuel prices, demand in the national retail market outpaced new supply in all four quarters of 2015, as positive absorption across all property subtypes facilitated improving market fundamentals. Demand for available retail space in the neighborhood/community segment was particularly encouraging during the year. As evidenced by healthy retail sales figures in spite of declining foot traffic and shrinking footprints among big-box retailers, the emergence of e-commerce continues to impact absorption levels in the retail market. Absorption in the retail market also remained positive across all regions in 2015. From a year-over-year perspective, absorption in the national retail market was strongest in the South region, with the Dallas-Fort Worth, Atlanta, Raleigh, South Florida, Austin, and Orlando markets absorbing excess capacity at the most robust rates. Absorption was also strong in the West region, particularly in the Bay Area markets, with the Phoenix and Las Vegas markets also recording significant improvements in demand for retail space. Although remaining positive for the year, the pace of absorption in the Northeast region appears to be slowing. Absorption in the Midwest region continued to gather momentum during the year, but absorption figures in the Midwest region remained more modest from a national perspective. Bolstered by competition in the grocery space for market share, the pace of absorption in the Twin Cities retail market increased during the year. Absorption in the Twin Cities market was strongest within neighborhood centers in 2015, with the Northeast submarket logging the most robust demand. Although new development in the retail sector remains modest relative to historical norms and other property types, construction activity accelerated slightly in 2015 compared to recent years, though a noticeable divergence in activity among retail segments exists. New construction levels of power centers are considerably lower than in previous cycles, while construction activity for grocery-anchored community/neighborhood centers has regained momentum, indicating an improving outlook among smaller retailers. Development activity also remains bifurcated by location. In contrast to recent cycles, in which developers were chasing rooftops into outer ring suburban and exurban locations, a greater amount of new retail development is occurring in the nation’s urban core, with developers targeting infill sites in walkable and transit-oriented locations. Among regions, new retail construction activity is strongest in the South region, followed closely by the Northeast and West regions. The amount of new inventory added in the Orlando retail market doubled in 2015 compared to the year prior, with the pace of new construction expected to further increase in 2016. New retail development remains relatively muted in the Midwest region, but was supported by healthy activity across a number of markets in 2015, including the Kansas City, Detroit, and Indianapolis markets. Retail construction levels remain consistent in the Twin Cities market, and mirroring trends observed at the national and regional levels, a majority of new construction in the local market consists of grocery and grocery-anchored neighborhood space. In contrast to trends observed at the broader levels, however, retail development activity in the Twin Cities market remains healthy in outer ring suburbs, including Woodbury and Plymouth. Aided by modest new construction activity, the average vacancy rate in the national retail market trended downward by another 20 basis points in 2015, declining into the low-10.0% range at the close of the year. Occupancy levels within the retail sector continue to be highly bifurcated by location, with properties in strong locations within good trade areas thriving and properties in weaker trade areas struggling to regain momentum. Retail occupancy levels are highest within the West and Northeast regions, though several markets in the South region demonstrated the most substantial improvements in occupancy levels compared to the prior year. In spite of an aggressive pace of new construction and the downturn in the energy industry, retail vacancies decreased in the four largest markets in the state of Texas. Developers delivered nearly 4 million square feet of retail space in the Dallas-Ft. Worth market in 2015, yet occupancy in the market reached the highest levels recorded over the last 10 years. Vacancies in the Midwest are strongest in the Columbus market, yet the biggest improvement in occupancy levels within the region was recorded in the Detroit market. Retail vacancies declined in the Twin Cities market during the year, and despite healthy demand for neighborhood centers, occupancy levels remain strongest at regional and super regional centers. Among submarkets in the Twin Cities area, retail vacancies are tightest in the Southwest submarket, but encouraging demand, led to the most impressive gains in occupancy levels within the Northeast submarket. After advancing by 1.0% in 2013 and 1.7% in 2014, asking rents in the national retail market increased by 2.0% over the year ended December 2015. Led by rent growth in excess of 5.0% within the San Francisco, Orange County, Los Angeles markets, the strongest rent growth within the retail sector was noted in the West region during the year, followed closely by the South region. Rent growth within the Northeast region was relatively tame in 2015, decelerating slightly during the course of the year, while rent growth remained generally subdued in the Midwest region. Rent growth in the Midwest region was led by the Indianapolis, Kansas City, and Milwaukee markets, with asking rents also advancing in the Twin Cities market. On a per square foot basis, property prices in the national retail sector increased by approximately 2.5% year-over-year in 2015, as capitalization rates trended downward by 30 basis points during the year, yet overall sales volume in the national retail market decreased to $82.5 billion in 2015, down 5.0% compared to the year prior. Accounting for approximately 19.0% of all sales activity among the four major property types in 2015, sales activity in the retail sector was strong in the first quarter of 2015 and then tapered off in the remaining three quarters of the year. Investor interest in the retail sector remains strong for single-tenant net lease assets, with particularly strong competition among buyers for available drugstore and quick-service restaurant assets. Transactions involving net lease drugstores selling for more than $10 million totaled at least 14 in 2015. Five of the 14 sales transactions over $10 million involved net lease drugstores that also sold for more than $1,000 per square foot. The largest net lease drugstore sale transaction during the year involved a 16,000-square-foot Walgreens located along The Strip in Las Vegas. Built in 2000, the property is located along Las Vegas Boulevard, just north of the Wynn and Encore and across the street from the planned World Resorts Casino. Equating to over $2,300 per square foot, the property sold for $37 million in October 2015. 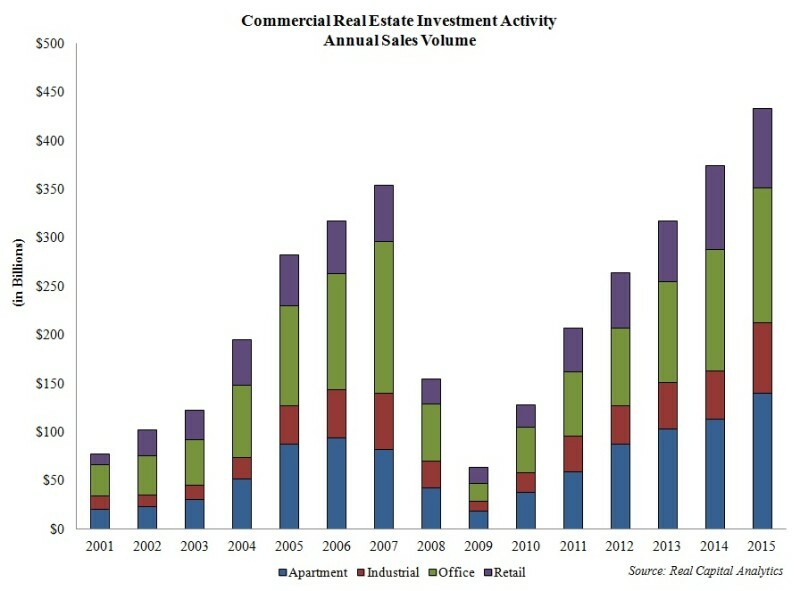 In addition to strong interest for single-tenant net lease assets, investment activity in regional and super regional malls accelerated during the course of 2015, as investors demonstrated renewed interest in obtaining large retail assets in some of the markets hit hardest by the subprime crisis. More specifically, investment interest in larger retail assets increased within the Atlanta, Las Vegas, Phoenix, and South Florida markets. Kimco Realty Corporation purchased the 850,000-square-foot Christown Spectrum Mall for $115.25 million in November 2015. Additionally, a joint venture purchased the Tempe Marketplace in October 2015 for $367 million. Located along the 202 corridor in the city of Tempe, Arizona, the Tempe Marketplace is an expansive open-air super regional mall that is situated in close proximity to the main campus of Arizona State University and Marina Heights. Further demonstrating improvements in the regional and super regional mall segments, Taubman Centers and Macerich announced an agreement to purchase Country Club Plaza just after the close of 2015. Located approximately four miles south of downtown Kansas City, Country Club Plaza is a 15-block, mixed-use development containing 1.3 million square feet of retail and office space. A sale transaction closed on the property later in the first quarter of 2015 for $660 million. Additionally, MGM Resorts International has reportedly reached an agreement to sell the Shops at Crystals mall to group led by Simon Property Group for $1.13 billion. Sales volume in the Twin Cities retail market increased by 20.0% in 2015 compared to the year prior. One notable transaction during the year included Heitman purchasing the former Knollwood Mall in St. Louis Park for $106.7 million. Situated along Highway 7, just east of Highway 169, the property has undergone the transformation to a grocery-anchored community shopping center. According to the latest Beige Book, seven of twelve Federal Reserve Districts, including the Minneapolis District, reported increasing economic activity. Economic activity in four of the remaining five districts was noted as mixed or flat, with economic activity declining in the Kansas City district, due to weakness in the energy and manufacturing sectors. Construction, business investment, and consumer spending continue to take on leadership roles in driving the domestic economy, while global economic concerns as well as conditions in the oil and gas industry and manufacturing sector continue to serve as drags on more robust growth. Fostering growth in the construction sector, the pace of homebuilding has begun to accelerate and commercial construction activity remains strong across numerous major markets. Business investment and consumer spending levels also remain encouraging; with conditions in the labor market continuing to tighten. The energy industry continues to be hamstrung by a glut of supply and tepid demand, resulting in lower commodity prices. In the state of North Dakota, the number of active drilling rigs has fallen to the lowest levels observed since 2009. Spot prices for West Texas Intermediate and Brent crude both declined by over 30.0% in 2015, putting significant pressure on producers, with retail gasoline prices falling by roughly 26.8% providing considerable relief to consumers and supporting healthy retail sales. Although the overall economy expanded for the 81st consecutive month in February 2016, activity in the manufacturing sector contracted for the 5th consecutive month in this period, yet nine of 18 manufacturing industries continued to report growth. According to the latest ISM Report on Business, the manufacturing sector showed some improvement in February of 2016 compared to year-end 2015, but the Purchasing Manager’s Index (PMI) remained below the pivotal 50.0% mark. 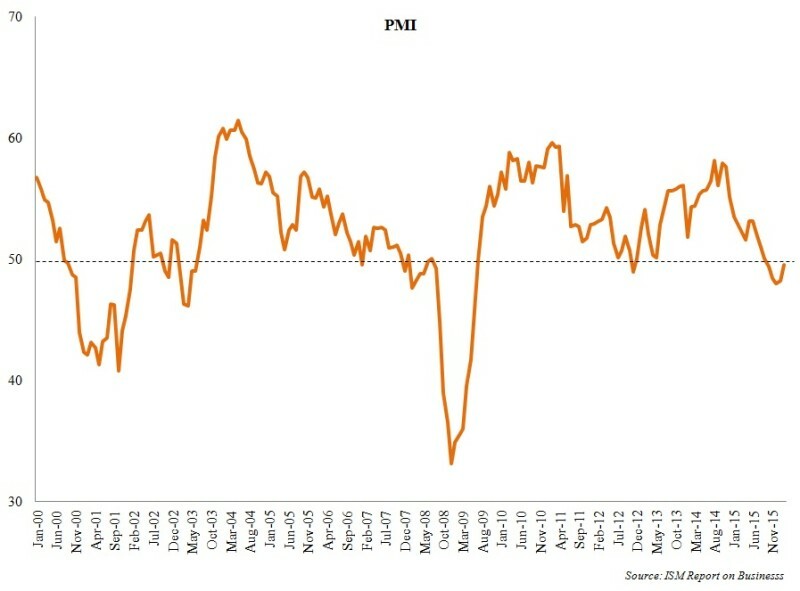 The PMI registered 49.5% in February 2016, up from 48.0% in December of 2015, but down from 52.9% recorded in February 2015. A strong dollar and the downturn in the oil and gas industry are also adversely affecting conditions in the manufacturing sector, with choppy and uneven results recorded across the manufacturing sector during the year. Manufacturers that rely on oil as an input cost have fared relatively well, while companies that provide goods to oil and gas companies have suffered. All segments in the manufacturing sector, however, have been impacted to varying degrees by the strength of the dollar, as international export levels at several major ports have sagged. Several other economic indicators remain mixed. Activity in the non-manufacturing sector increased for the 73rd consecutive month in February 2016, with the Non-Manufacturing Index (NMI) standing at 53.4%, yet the most recent NMI readings have fallen below the rolling 12-month average of 56.6%. After falling by 0.3% in December 2015, the Conference Board Leading Economic Index also slipped another 0.2% to 123.7 in January 2016. In spite of rising concerns, most economic indicators continue to signal modest economic expansion in the months ahead. While representing a slight deceleration from the 2.2% increase recorded in 2014, non-farm employment at the national level increased by 2.0% year-over-year in December 2015 on the net addition of over 2.7 million jobs. Employment growth in the service-producing sectors increased by 2.1% over the year ended in December, up from 1.9% posted 12 months prior. The goods-producing sectors also noted improvements, but the pace of growth decelerated from 2.9% in 2014 to 1.0% in 2015. Marking the second consecutive year of positive, albeit modest, improvements, headcounts in the public/government sector increased by 0.5% in 2015, on par with the growth recorded one-year ago. 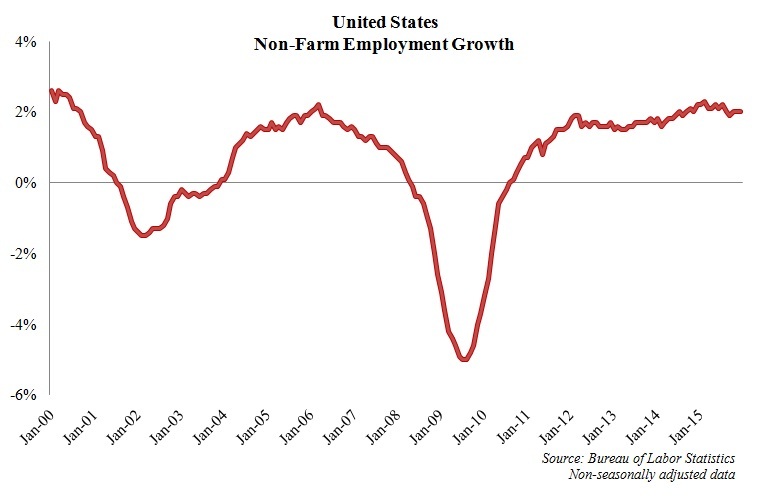 The following chart presents non-farm employment growth at the national level. Facilitated by employment growth, the national non-seasonally adjusted unemployment rate decreased to 4.8% in December 2015, remaining unchanged compared to the month prior, but down 60 basis points from 5.4% recorded in December of 2014. Tight conditions in the construction sector are creating significant upward pressure on skilled labor wages, yet wage growth remains uneven across employment sectors. 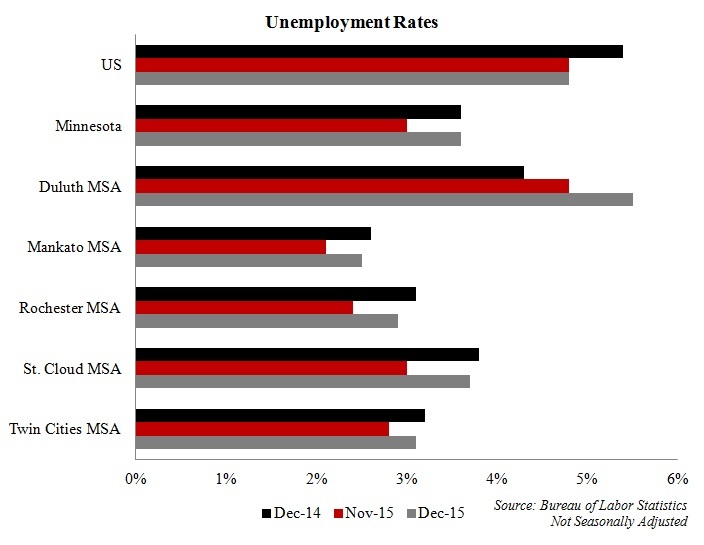 Conditions in the labor market are healthy in the majority of major markets. Non-farm employment increased by over 3.0% annually in 18 of the largest 84 metropolitan areas during year, with 16 of the 18 markets also boasting unemployment rates below 5.0%. The pace of job growth remains strong across a number of markets in the West region, but hiring activity continues to gain momentum in several Midwestern markets. The following tables present the nation’s top 10 leaders and laggards in unemployment rates and employment growth. Leading non-farm employment growth in the Midwest region were the Sioux Falls and Grand Rapids metropolitan areas, which witnessed year-over-year employment growth of 4.1% and 3.8%, respectively. 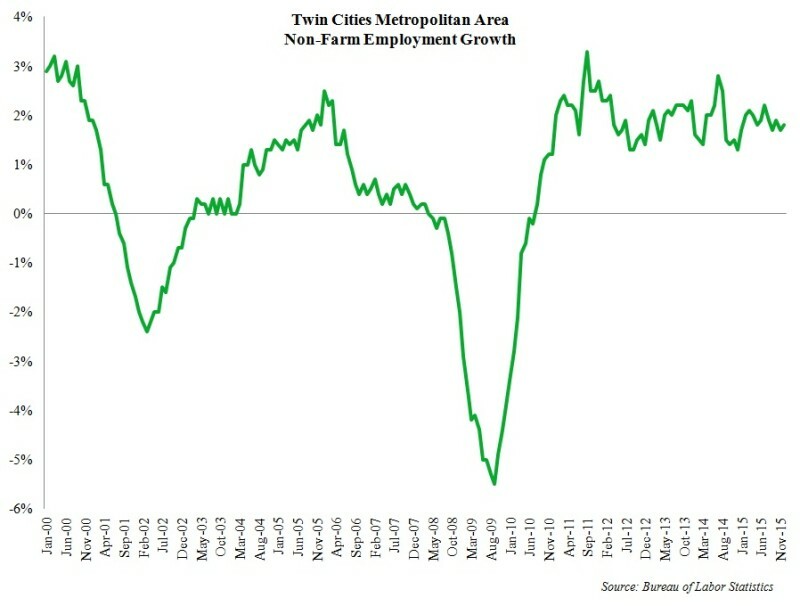 Non-farm employment in the Twin Cities metropolitan area increased by 1.8% year-over-year in 2015 on the net addition of approximately 34,000 jobs. Job growth within several of the Twin Cities largest employment sectors, including education/health services, professional/business services, and financial activities, remained particularly encouraging, though the strongest growth was within the leisure/hospitality sector during the year. Unemployment rates within 68 of the largest 84 metropolitan areas were below 5.0% at the close of 2015. Labor markets are tightest in the Midwest region, with seven of the largest metropolitan areas enjoying unemployment rates at or below 3.5%. The non-seasonally adjusted unemployment rate in the state of Minnesota stood at 3.6% in December 2015, unchanged compared to the year prior, but up 60 basis points compared to 3.0% posted in November of 2015. 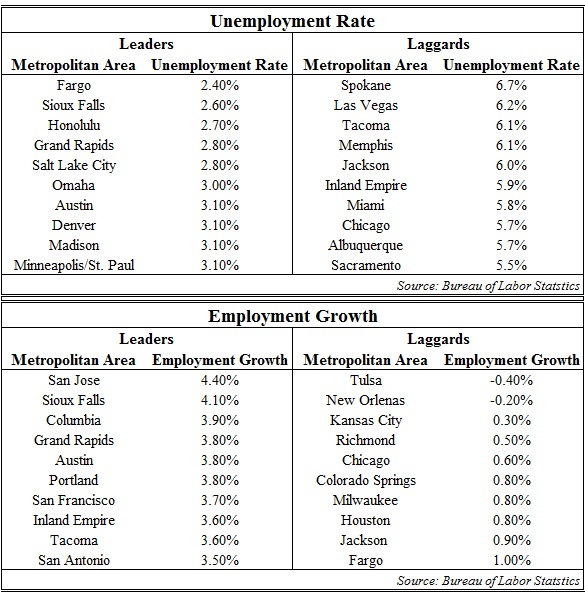 Labor markets in most Minnesota metropolitan areas remain relatively tight. Unemployment remains lowest in the Mankato area (2.5%), followed by the Rochester (2.9%) and Twin Cities (3.1%) areas, while unemployment stands above the statewide rate in the St. Cloud (3.7%) and Duluth (5.5%) areas. Sales activity and prices increased by sizeable margins in the national for-sale residential market during the year. Existing home sales activity increased by 6.3% in 2015, compared to a decline in 2014, while the pace of new single-unit home sales advanced at a more rapid rate, increasing by 14.6% in 2015. Activity within both the single-unit and multi-unit segments also showed improvement, as renewed demand continues to build for townhome and condominium product. In turn, the national median home sale price increased by 6.9% in 2015, rising from $208,400 to $222,700 during this period. Among regions, pricing increases in the for-sale residential sector were led by the West region, which witnessed the region’s median home sale price increase to $323,600 at the close of 2015, up 8.4% compared to the year prior. In the West region, the for-sale residential sector remains strong across most markets, with an aggressive pace of growth recorded in the Denver, Portland, and Seattle markets during the year. In the Denver market, the median home sale price has increased by over 20.0% within the last 24 months. Sale prices also are rising at a robust pace in markets hit hardest by the subprime crisis, with the median sale prices increasing by at least 9.0% in the Las Vegas, Orlando, and Phoenix markets in 2015. Although noting significant upward pressure in 2015, for-sale residential product remains a relative bargain in the Midwest region, with a median home sale price standing at $171,600 in the fourth quarter of 2015, nearly 20.0% below the national average. Progress continues to be noted within the for-sale residential sector in the Twin Cities market. Increasing from approximately 49,600 in 2014 to 56,390 in 2015, the number of closed home sale transactions in the Twin Cities market increased by 13.7% over the year ended December 2015. Indicating healthy demand, the average days on market decreased by 2.6% and the percentage of original list price received increased by 1.0% during this same period. Due to stronger competition among buyers, the median home sale price in the Twin Cities metropolitan area increased by 7.0% over the year ended December 2015, increasing to $220,000 at the close of the year. Employment growth and progress in the for-sale residential sector have supported a more optimistic outlook from homebuilders, and confidence among homebuilders rose to the highest levels in more than a decade in 2015. The National Association of Home Builders/Wells Fargo Housing Market Index increased to 60 in June 2015 and remained at or above that level through the close of 2015. Both commercial and residential construction activity remains strong in the Twin Cities market. In the city of Minneapolis alone, construction permits were issued for development projects valued at nearly $1.4 billion in 2015, marking the fourth consecutive year of over $1.0 billion in permitting activity. Construction is scheduled for completion on the new Vikings Stadium and massive Downtown East project in 2016, yet a number of significant development projects remain in various stages of the construction pipeline throughout the region that will support healthy activity into at least the intermediate term. Facilitated by healthy employment growth and favorable demographic trends, the apartment market continues to remain strong at the national, regional, and local levels, in spite of a wider new construction pipeline. Asking rents at the national level continued on an upward trend in 2015, marking the 6th consecutive year of asking rent growth in excess of 2.5%, while vacancy rates in the national apartment market remained essentially unchanged. Conditions in the Midwest regional and Twin Cities apartment markets closely mirrored trends observed at the national level, as underlying fundamentals and investment activity remain strong. Sales volume in for 50+ unit apartment properties in the Twin Cities market increased by approximately 6.4% over the year ended in December 2015, reaching nearly $900 million during the year. Apartment pricing in the Twin Cities market also continued on an upward trend during the year, and the average price per unit in the Twin Cities market increased by 32.0%, rising from $112,850 in 2014 to nearly $150,000 in 2015. Upward pressure on pricing in the Twin Cities market has been supported by a greater composition of sales activity involving newly built Class ‘A’ properties in the region’s core. Notable transactions in the Twin Cities market during the year involved several Class A buildings in the core of Minneapolis, including 222 Hennepin, The Paxon, and The Walkway. These three transactions combined to account for approximately 22.0% of sales volume involving 50+ unit properties in the Twin Cities market in 2015. Several large suburban apartment assets also traded in 2015. Valley Creek Apartments, a 402-unit apartment property in Woodbury, sold as a value-add property for $54.25 million in May of 2015, after selling for $33 million five year prior. Sales activity involving small- and mid-size properties also remained healthy through 2015. Fundamentals across the industrial, office, and retail sectors also continue to demonstrate improvement, with the most robust growth recorded within the industrial sector. Led by demand for logistics space, market conditions in the industrial sector at the national, regional, and local levels continued to improve in 2015, with strong absorption figures driving vacancy rates lower and putting upward pressure on asking rents. Absorption in the office sector has been supported by a more intense pace of employment growth within the traditional office-using employment sectors. Vacancy rates in office sector continue to trend downward, putting upward pressure on asking rents. In spite of the rise in e-commerce and the pursuit of smaller footprints by retailers, the retail sector also noted positive absorption in 2015. Combined with a more restrained pace of new development activity, demand for retail space facilitated improvements in occupancy levels and asking rents. Fueled by improving to strong underlying fundamentals, the availability of low interest rate financing, and attractive yields relative to alternative investments, investment activity in the commercial real estate market remained strong in 2015. Sales volume for property and portfolio sales of more than $2.5 million increased for the 6th consecutive year in 2015, with sales volume increasing on a year-over-year basis in three of the four major property types. The strongest year-over-year growth in sales volume was recorded within the industrial sector, yet overall sales volume continued to be led by the apartment and office sectors. The following chart presents national sales volume in the four major property types for property and portfolio sales of greater than $2.5 million. Data referenced in this report was current as of March 7, 2016, and includes preliminary employment numbers as reported by the Bureau of Labor Statistics, which are subject to revision. While continuing to face headwinds, encouraging demand was observed in the national office market in 2015, facilitating an increase in absorption at the national level compared to the year prior. Supporting demand, payroll figures among the traditional office-using employment sectors increased by nearly 3.0% year-over-year in 2015 on the net addition of nearly 1.5 million jobs, rising to a level more than 5.0% above the previous peak. Employment growth is supporting improvements in underlying market fundamentals, but a pronounced shift in space-per-employee ratios continues to adversely impact absorption figures. A more encouraging pace of absorption in the national suburban office market was observed in 2015, particularly across a number of markets with high technology location quotients. Tighter vacancy rates have fostered a more robust pace of rent growth within the CBD office market in recent years, leading more tenants to consider available suburban office inventory. Although the pace absorption in the suburban office sector at the national level has become more forceful, a clear distinction of leaders and laggards within nearly all markets has emerged. Supported by broad-based employment growth as well as favorable demographic and secular trends, healthy absorption figures supported tight market fundamentals in the national apartment market through 2015 in spite of a wider new construction pipeline. Non-farm employment at the national level increased by 2.0% year-over-year at the close of 2015 on the net addition of over 2.7 million jobs, with the national non-seasonally adjusted unemployment rate decreasing by 60 basis points in 2015, standing at 4.8% at the close of the year. In addition to employment growth, demographic tailwinds and secular trends in lifestyle preferences remain in place to facilitate a healthy pace of apartment absorption. An improving economic outlook among the prime renter cohort demographic and disciplined mortgage lending standards are expected to continue fostering healthy demand for apartments through at least the near term. Secular trends in lifestyle preferences include the pronounced shift away from homeownership and emergence of renters by choice among the prime renter cohort and baby boomer populations, with both demographic groups appreciating the maintenance-free living and financial flexibility offered by apartments. As of the fourth quarter of 2015, the national homeownership rate stood at 63.8%, down from 64.0% recorded 12 months prior and a peak of 69.1% in the first quarter of 2005. Sales volume in the for-sale residential market, however, increased at the national level in 2015. While the apartment market is expected to remain on solid footing, competition from the for-sale residential sector is likely to increase in the near term, as rent-to-own metrics are projected to tilt more heavily in favor of ownership in some markets. An improving economic outlook within the prime renter cohort will also test the strength of secular trends, yet the demographic trends in favor of rental units is undeniable. For example, the for-sale residential sector in the Orlando market recorded a significantly strong activity during the year, providing stronger competition to the area apartment owners and operators. In spite of the competition, the population in the Orlando market increased by approximately 3.0% to support healthy apartment demand within the market in 2015, driving the vacancy rate down to 4.2% while rents advanced by over 6.0% during the year. Recording positive absorption figures across nearly all major markets, demand for apartment units remains strongest in the West and South regions. Positive absorption was recorded throughout the Midwest, but due to a more measured pace of household formation and population growth, demand for apartment units remains modest compared to other regions. Demand in the Twin Cities apartment market remained consistent throughout 2015, and the pace of absorption during the year mirrored that of 2014. Employment growth and demographic trends are driving demand in the Twin Cities apartment market. Household incomes in the Twin Cities metropolitan area compare favorably from a regional perspective, but the median home sale price in the local market remains among the highest in the Midwest and sales prices in the Twin Cities for-sale residential sector continue to increase, preventing many potential buyers from entering into home ownership. New construction added just over 230,000 units to the national apartment inventory in 2015, down approximately 7.0% from roughly 250,000 units delivered in 2014. Despite a modest decrease in 2015, new apartment construction levels continue to remain at or above historical norms within many markets, outpacing demand during the year. Apartment developers continued to focus efforts in growth markets in the South and West regions during the year, with new deliveries over the last 24 months representing over 5.0% of existing inventory in the Houston, Seattle, Denver, Nashville, Austin, and Charlotte markets. New apartment construction activity also remains healthy throughout much of the Northeast and Midwest regions, but deliveries in mature markets are more moderate compared to growth markets in the South and West regions. New apartment construction volume in the Midwest region during the year was led by the Chicago market, with the Twin Cities, Columbus, and Kansas City markets trailing closely behind in the number of units reaching lease-up in 2015. Similar to trends observed throughout much of the nation, new apartment deliveries in markets across the Midwest region have been heavily concentrated in core and close-in submarkets. Apartment developers are active in the Twin Cities market, and a greater amount of activity is beginning to occur outside of the Minneapolis core. 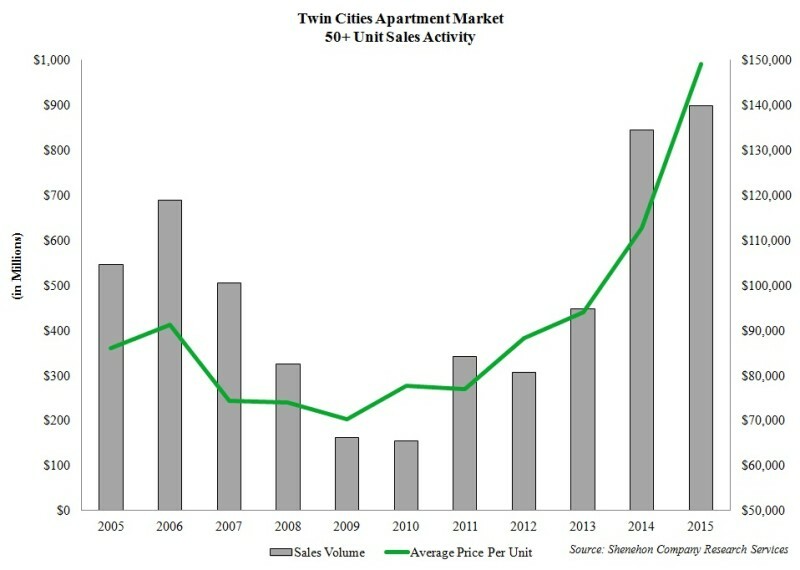 Approximately 15,000 units have been added to the Twin Cities apartment inventory over the last four years, with a significant percentage of new product being delivered in the downtown and uptown areas of Minneapolis. Nearly 4,000 units are scheduled to reach lease-up in the Twin Cities market in 2016, and signaling that new apartment construction activity will remain healthy through at least the near term, multifamily permitting activity in the Twin Cities metropolitan area increased in 2015. Multifamily construction permits were issued for 4,810 units in 2015, up from 4,608 units permitted in the year prior and 4,634 units in 2013. In spite of strong construction levels, the vacancy rate in the national apartment market remained essentially unchanged during the year, rising a mere 10 basis points from 4.3% in 2014 to 4.4% at the close of 2015. Vacancy rates among assets classes, however, have begun to move in diverging directions, with vacancy rates at top-tier, Class A properties softening and occupancy levels among lower-tier properties further tightening and remaining strong. Rising since the first half of 2013, vacancy rates among Class A properties at the national level are approaching the high-5.0% range, while the average vacancy rate in the Class B/C segment has trended lower during this period, declining into the low-3.0% range at the close of 2015. The concentration of new construction activity aimed at delivering top-tier product within core areas impacted overall vacancy rates in a few markets. Despite healthy demand for apartment units, occupancy levels in the Denver market declined in 2015, with the market’s vacancy rate increasing by approximately 50 basis points during the year. Construction activity in the Denver apartment market is expected to remain strong through the near term, with approximately one-third of new units scheduled to be delivered in the Downtown Denver submarket. Concern over the future direction of underlying fundamentals in the Downtown Denver submarket is not indicative of the outlook for the Denver apartment market as a whole, as conditions are projected to remain strong within several submarkets. Led by tight conditions throughout markets in the Northeast region, including the New York City, Boston, and Northern New Jersey markets, average vacancy rates remain below the market equilibrium of 5.0% in approximately 85.0% of the nation’s largest 50 markets. Although apartment vacancy rates are strongest within the Northeast region, some of the most impressive improvements in apartment occupancy levels during the year were noted in markets within the Midwest region, including the Chicago, Cleveland, and Detroit markets. Apartment occupancy levels in the Twin Cities market remain among the tightest in the nation. The average apartment vacancy rate within the Twin Cities market continues to hover in the low- to mid-3.0% range, with upward pressure within the Class A segment in the urban core weighing on overall vacancies. Outpacing the 3.7% gain noted in the year prior, the average asking rent in the national apartment market increased by approximately 4.0% over the year ended December 2015, as asking rents increased in excess of 2.5% for the sixth consecutive year in 2015. A number of secondary and tertiary markets, including the Portland, Orlando, and Charlotte markets, demonstrated the most robust gains in asking and effective rent growth during the year, while signs of weakness in effective rent growth were observed across several primary markets that have been saturated with new deliveries in recent years. Moving forward, the pace of new construction activity and concerning rent-to-income ratios across many markets at the national level are anticipated to temper the pace of rent growth. Developers are scheduled to deliver over 300,000 units to the national apartment inventory in 2016, with another 200,000 units likely to reach lease-up in 2017. Meanwhile, rent-to-income ratios have surpassed the pivotal 30.0% market in a number of markets, as rent growth for apartment units has far exceeded wage growth in recent years. Among regions, asking rent growth was led by the West and South regions. Though occupancy levels remain tight, rent growth remained more restrained in the Midwest and Northeast regions. Rent growth in the Midwest region was led by the Chicago market and followed by the Twin Cities, Detroit, Indianapolis, Kansas City, St. Louis, and Columbus markets, all of which noted asking rent growth in excess of 3.0% year-over-year in 2015. Encouraged by economic improvements and employment growth, asking rents in the Detroit market advanced by 3.0% in 2015, while vacancies declined by 150 basis points to fall below the market equilibrium of 5.0%. Asking rents in the Twin Cities apartment market increased at a healthy pace in 2015, with the Class A segment recording a stronger pace of asking rent growth. Effective rent growth, however, was strong in the Class B/C segment during the year. Accounting for approximately 32.0% of all sales activity among the four major property types, sales volume in the national apartment market increased year-over-year by nearly 24.0% in 2015, as the average per unit price increased by roughly 5.0% during the year. Sales prices are exceeding previous peak levels across nearly all major markets at the national level. Apartment pricing continued on an upward trend in 2015 in the face of minimal capitalization rate movement and less aggressive rent growth underwriting assumptions among buyers in stabilized deals. Capitalization rates in the national apartment market remained stable through the first half of the year, but strong capital flows put downward pressure on capitalization rates in the second half of the 2015. The average capitalization rate in the national apartment market remained essentially unchanged at the close of 2015, declining 10 basis points compared to the year prior, with the average capitalization rate falling just below 6.0% by the close of the year. Among regions, apartment capitalization rates remain lowest in the West region, with the highest capitalization rates observed in the Midwest region. Regardless of regional location, quality apartment assets in high barrier-to-entry markets across the nation are trading at capitalization rates below 5.0%. 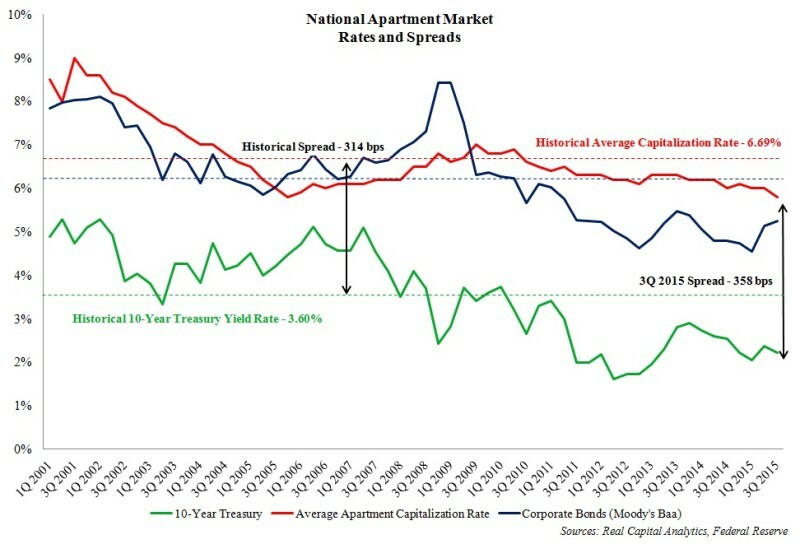 In spite of the modest capitalization rate compression observed, the risk premium spread in the national apartment market remains wider compared to historical norms, with a spread of 358 basis points over the 10-Year Treasury as of the third quarter of 2015. Adding to an already crowded pool of buyers, foreign investors have continued to become more active in the national apartment market. Though largely targeting top-tier apartment assets in primary markets, stronger interest and allocations from foreign investors has pushed institutional investors to move into secondary and tertiary markets to win deals. Sales volume in the national apartment market was consistent through all four quarters in 2015, but strong sales volume during the year was driven by a number of large portfolio and entity-level transactions, including Lone Star Funds $7.6 billion acquisition of Home Properties. One notable single-property transaction at the national level included the sale of Sharon Green, a 296-unit apartment asset in Menlo Park, California. Built in the 1970s, Essex Property Trust sold the 296-unit Sharon Green apartment complex for $245 million or approximately $825,000 per unit in December 2015. The largest transaction in the Midwest region involved a 2,226-unit apartment complex in the northern suburbs of the Detroit market that traded for $216 million or $97,035 per unit in July 2015. Built in the late 1960s, the property, known as Somerset Park, is situated approximately 250 acres within the city of Troy, Michigan. Greater economic activity and a resurgence of business investment in the greater Detroit region is projected to support continued progress and drive investment activity in the Detroit apartment market. Sales volume in for 50+ unit apartment properties in the Twin Cities market increased by approximately 6.4% over the year ended December 2015, reaching nearly $900 million during the year. Apartment pricing in the Twin Cities market also continued on an upward trend during the year, and the average price per unit in the Twin Cities market increased by 32.0%, rising from $112,850 in 2014 to nearly $150,000 in 2015. Upward pressure on pricing in the Twin Cities market has been supported by a greater composition of sales activity involving newly-built Class ‘A’ properties in the region’s core. Notable transactions in the Twin Cities market during the year involved several Class A buildings in the core of Minneapolis, including 222 Hennepin, The Paxon, and The Walkway. These three transactions combined to account for approximately 22.0% of sales volume involving 50+ unit properties in the Twin Cities market in 2015. Several large suburban apartment assets also traded in 2015. Valley Creek Apartments, a 402-unit apartment property in Woodbury, sold as a value-add property for $54.25 million in May 2015, after selling for $33 million five year prior. Sales activity involving small- and mid-size properties also remained healthy through 2015.